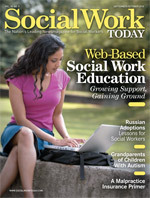 Whether or not you support it, Web-based social work education is growing. Learn about what these programs offer, their advantages, and what obstacles they still face. For Jeffrey Hehman, the idea of adding graduate classes to an already busy work and family schedule seemed overwhelming. But then he discovered the online offerings at Florida State University’s College of Social Work. Instead of spending time in a classroom, he could complete his coursework at home in a way that accommodated his schedule. It is a question many students are asking. As technological advances make online interaction easier and students’ lives outside the classroom get busier, interest in online social work education continues to increase. Although it’s long been common for schools to offer online courses sporadically, a growing number of schools are making Web-based learning an integral part of their MSW programs. A leap forward in this process is likely to come this fall when the University of Southern California (USC) welcomes its first cohort of MSW students to a new virtual academic center in October. The program will be available to social work students nationwide. USC has about 950 students in its existing classroom-based MSW program, and it expects to admit more than 900 students into its Web-based program in 2011. Students in USC’s program will engage in various Web-based learning activities, including attending online lectures, watching videos, and interviewing virtual clients. They will be placed in traditional internships supplemented by practice with avatars developed for the online environment. Thus the program will have both synchronous and asynchronous elements, meaning students will be expected to be online at specific times for some activities but will be able to engage in other activities on their own schedules and will practice skills in traditional centers. One main attraction of the program is that it will allow students to access the quality of a USC education while being able to continue to live and work in their home states, Maiden says. “The program becomes portable for them,” he notes. The program could be attractive to potential faculty, too. Over time, USC expects to bring on 85 to 100 new full-time faculty members as a result of its online program, according to Maiden. And like the program’s students, these faculty members won’t have to move to California to participate. However, faculty will be brought into the USC community both virtually and in person at various stages of their development in the school’s teaching program and will be strongly encouraged to attend significant student events such as graduation. USC’s program joins various other online programs already operating around the country. Some schools such as Texas State University-San Marcos and the University of North Dakota offer online MSW programs to students both with and without BSWs. Florida State’s program is limited to advanced-standing students, while Michigan State University and the University of Hawaii offer hybrid programs blending online classes with face-to-face interaction. Schools offering Web-based courses use a variety of course-delivery tools, such as online videos, webcam discussions, and chat rooms. Some programs set limits on where perspective students can reside geographically, while others are open to students nationwide and even internationally. The Council on Social Work Education (CSWE) keeps an informal directory of BSW and MSW programs with online components on its website at www.cswe.org. Convenience continues to be the primary draw of online social work education. Students can take classes in a way that fits their schedules instead of having to work around institutions’ schedules. Even students in programs that require them to be online at specific times are spared hassles like driving to school and finding parking. That’s especially important in areas where students are spread out geographically and whose class attendance is often interrupted by bad weather, says John Sougstad, EdS, LMSW, a clinical instructor at Michigan State’s School of Social Work. “The online environment does away with Mother Nature’s interference,” says Sougstad, who also is the coordinator of a program that offers online courses to students seeking to become school social workers in Michigan. Another benefit of online programs is that they make social work education more accessible to students in rural areas or areas otherwise underserved by schools of social work. For instance, many prospective MSW students at the University of Hawaii’s School of Social Work had to move to the island of Oahu to pursue their degrees and often did not move back to their home islands after graduation. Offering online classes means more of these students stay put and use their social work skills in their home areas, says Violet E. Horvath, PhD, an assistant professor and the school’s program coordinator for distance education. There are other benefits as well. Hehman says online classes helped him learn how to more clearly and concisely articulate his thoughts in writing. And despite traditional concerns that online classes limit students’ ability to socialize, some students who have taken classes online find the process helps them make connections they would not have made in classrooms. Quieter students who may be drowned out during classroom discussions often blossom online, says Mary Jo Garcia-Biggs, PhD, LCSW, an assistant professor and MSW distance education coordinator at Texas State University-San Marcos. Patty Ray, LMSW, who graduated from Texas State’s program in 2008, says she and her fellow students formed a tight-knit community online. Although advancing technology is making it easier for students to participate in online learning, a Web-based environment is not ideal for everyone. Both program administrators and students with experience in online classes agree that self-motivation and self-discipline are the key ingredients for success in Web-based learning. Students in a classroom-based course may get away with falling behind with readings and assignments, but that approach doesn’t work well online. Some schools try to address these concerns during the admissions process. Applicants to Michigan State’s program, for example, must complete a mini course online to determine whether they are suited for Web-based learning. Texas State University offers a quiz that prospective students can take to see whether they would fit into an online program. Jolie Hoogland, a student in the University of North Dakota’s online MSW program, advises people considering online classes to take time for self-reflection to determine whether their personalities fit a Web-based environment. It’s also important to consider how committed an institution is to online learning. Setting up a successful online program takes more than a fancy website. A school must be committed to investing the necessary resources—financial and otherwise—to ensure a high-quality product, Freddolino says. “You really need support from administration on the top to offer a quality program and quality courses,” he says. One area where investment is vital is field education. Many schools hire people in the states or regions they serve to coordinate the placements of online students. In some cases, faculty and administrators will personally visit field sites to maintain rapport with students’ supervisors. A successful program requires faculty who are willing to learn about new technologies and new ways to use technology to educate students. Convincing faculty accustomed to face-to-face education to accept online education and assuaging their concerns about it can be a challenge, says Craig Stanley, MSW, LCSW, director of Florida State’s MSW program. And it can be a rough transition even for faculty who are willing to take the plunge because preparing to teach online courses often requires more preparation than classroom-based courses, Garcia-Biggs says. The social work profession’s continued discomfort with—and sometimes opposition to—online education may ease as increasingly technologically savvy students graduate and enter the vocation. The profession must embrace online learning and other technologies and not run away from them, Hehman says. Social work schools may soon have no choice but to join in the online trend. The emergence of large, national-scope programs like USC’s will put competitive pressure on other schools to consider whether they want to move toward online education, Freddolino says. Horvath says she hopes the profession can find some way to take advantage of the online education trend without sacrificing the personal interaction that has been the cornerstone of social work education. How Does a Web-Based Environment Affect Students? York (2008) compared groups of students taking a social work administration course in either a classroom, an online, or a hybrid format. The results found no significant differences between the students when it came to knowledge gain, gain in self-efficacy, and course satisfaction. Oterholm (2009) identified benefits and disadvantages of asynchronous and synchronous communication in a study of students in an online social work class. Students reported that they liked the flexibility of asynchronous communication but disliked the reduced spontaneity in discussions. Students using synchronous modes of communication felt more connected but cited difficulties in keeping up with online discussions involving multiple participants. Wilke, Randolph, and Vinton (2009) found that students in online social work classes, despite their lack of in-person interaction, engaged in a process of mutual aid whereby they shared information, engaged in discussions, and supported one another. The authors suggested that certain elements of online classes, such as small-group interactions, discussion boards, and prompt instructor response to student communication, help foster a sense of connection between participants. MacFadden (2007) examined the role that emotions—both positive and negative—play in students’ reaction to and interactions during online classes. Results from a focus group of students who had completed a Web-based course highlighted the importance of understanding how the online environment affects students’ emotions and how they choose to express those emotions. The challenges of designing successful online classes go beyond students. Social work educators and administrators interviewed in a study by Knowles (2007) identified several other challenges to implementing Web-based instruction, including finding administrative and financial resources, engaging faculty, and ensuring that instruction is congruent with the values of the profession. Knowles, A. J. (2007). Pedagogical and policy challenges in implementing e-learning in social work education. Journal of Technology in Human Services, 25(1), 17-44. MacFadden, R. J. (2007). The forgotten dimension in learning: Incorporating emotion into Web-based education. Journal of Technology in Human Services, 25(1), 85-101. Oterholm, I. (2009). Online critical reflection in social work education. European Journal of Social Work, 12(3), 363-375. Wilke, D. J., Randolph, K. A., & Vinton, L. (2009). Enhancing Web-based courses through a mutual aid framework. Journal of Teaching in Social Work, 29(1), 18-31. York, R. O. (2008). Comparing three modes of instruction in a graduate social work program. Journal of Social Work Education, 44(2), 157-172.